A completely cloud-based software system, NetSuite Ecommerce is a complete ecommerce platform and business management suite that allows you to manage your whole organization from within the cloud. It integrates with all of NetSuite’s business software solutions, or functions as a stand-alone service. NetSuite Ecommerce provides tools for streamlining and automating ecommerce operations, as well as driving growth in your business’s ecommerce channels. This ecommerce solution is flexible for consumer and business-targeted channels, as well as integrating retail, order fulfillment, customer service, and more into one business application; and it works across channels, websites, and international regions. NetSuite Ecommerce also helps you merge your online channels with your brick-and-mortar channels using one system that controls your whole business at once. You can also deploy websites easily and quickly with NetSuite’s content management and site hosting capabilities. Benefits also include managing as many web storefronts as you need, as well as carry on commerce in multiple countries, currencies, languages, and channels. NetSuite can host your website, or you can have it host it elsewhere. Database-driven content ensures your website is up-to-date all the time and synced with your business operations. Handle product lists, product availability, images, and languages. 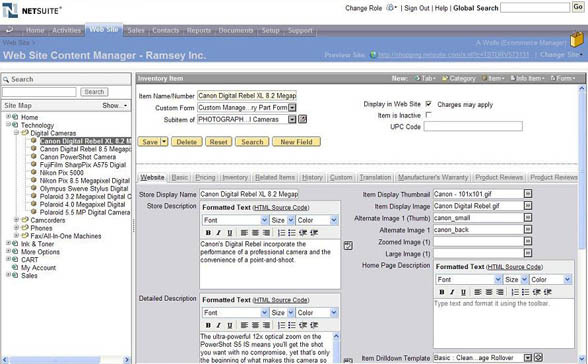 Host customized HTML pages with NetSuite Ecommerce’s customizable publishing tools. Upload style sheets and customized site elements, including headers, footers, sidebars, buttons, tab bars, and content wrappers. Build personalized pricing and content for your customers: show different items, content, and pricing depending on a customer’s price level, grouping, and purchase history. Help visitors find relevant content quickly with built-in site search. Quickly and easily create as many forms in as many types as you need. Establish custom questions, define how visitors can respond (optional or required, open entry or multiple-choice), route submissions and automatically build a real-time customer record. Build as many websites as you want and manage the stores from a single account, even with different product sets, domain names, branding, shopping rules and store-specific carts, and account areas for customers. Support and switch between multiple currencies. Automatically handle local sales tax for multiple regions. Multi-language support: allow shoppers to choose their language of choice. Combine the usual web metrics with specific customer activity data and transaction data. Built-in reports show how customers found you, where they visited on the site, and generated revenue from referrers and keywords from SEO. Gain more insight into traffic and shopping cart abandonment. Accept payments from credit cards and multiple currencies, as well as Google Checkout and PayPal options. Built-in PCI-compliant security measures prevent fraud using features like Credit Card Security Codes, the Credit Card Address Verification System (AVS), and Verified by Visa and MasterCard SecureCode systems. Shoppers can save their information for future purchases. Create coupons and discounts for specific items, or restrict other items from being discounted. Provide volume discounts and offer different price levels for sub-item options. Extend special pricing offers to specific customers. Sell online gift certificates at fixed-price amounts or customer-chosen values, as well as accept gift card payments on your site. Display up-sell and cross-sell recommendations depending on what other customer purchases. Show automated recommendations and set manual up-sell recommendations. Publish a list of catalog items to your website. Export catalog items to publisher, comparison engine, or other outside tools. Organize items into multiple categories and categorize items by season or holiday. Manage items with various attributes on a single page. Create a separate SKU for each attribute with its own inventory and pricing. 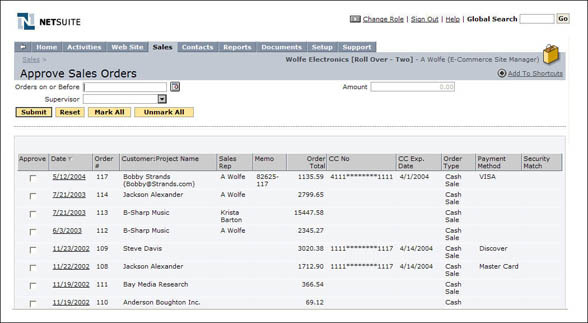 Push products to eBay directly from your NetSuite product catalog. 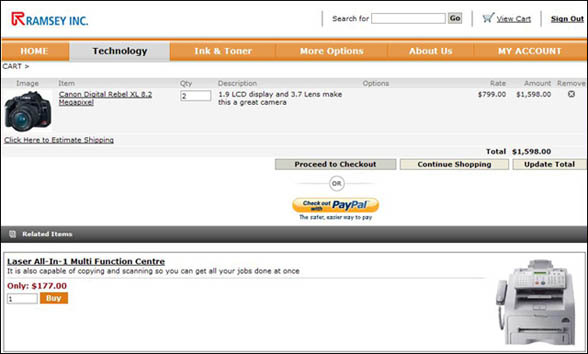 Receive orders from eBay buyers automatically. Change store inventory across websites, or keep it the same, and sell products at the same or different prices. Provide country-specific language and currency for each webstore. Track and report on each webstore’s sales activities. Maintain a single back-office system to organize cross-store operations and consolidate ecommerce activities. No needs to manually transfer customer orders into an order management system from your webstore, saving time to fulfillment. Send orders to your warehouse departments and accounts receivables. Integrated FedEx, UPS and USPS shipping for real-time shipping rates, automatically link tracking numbers to sales orders, print shipping labels, and give customers 24/7 tracking. 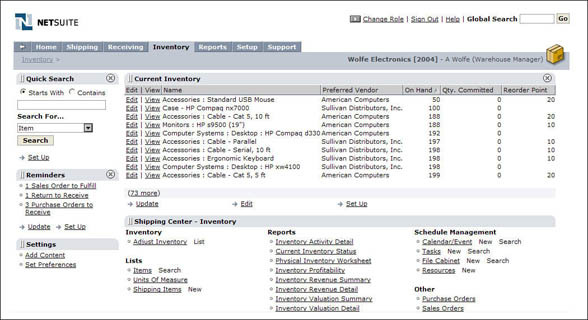 Make sure your online inventory reflects changes in your actual inventory in real-time. Customers can log in anytime to see their order status, track packages, view quotes, or request refunds. Customers can submit support tickets, review responses to previous inquiries, and read through your knowledgebase. Built-in SEO tools help improve your rankings in the major search engine. Submit meta data, page title tags, and images for your pages. Utilize SEO-friendly descriptive breadcrumbs and URLs. Redirect pages with 301 built-in redirects. Generate store traffic with SEO friendly catalogs. Remove needless information from dynamic pages. Manage end-to-end email process in a single system. Email personalization, SPAM-compliant auto-unsubscribe capabilities, and list de-duping. Optimize performance by measuring campaign effectiveness across the whole funnel, in real-time, from opens to clicks, order transactions, leads, and revenue. Real-time tracking and managing of paid-search marketing campaigns by keyword or search engine. Perform closed-loop analysis of leads driven by individual paid-search terms. Track how leads and revenue from affiliates and determine their commissions. Make promotional discounts associated with certain affiliates. Affiliates can view leads and sales they’ve made. Restrict the items to which the coupon applies and set minimum order amounts. Limit coupons to single use or by partners. Track coupon and promotion effectiveness and ROI by promotion codes. Generate online registration forms for events and marketing campaigns. Leads automatically populate to your CRM solution for quick follow-up. Track the results of all your marketing programs. Figure out how visitors are moving through your site, and track returning leads and customers. See site analytics for number of visitors, which pages they visited, whether they came back, etc. Mine NetSuite’s universal customer database to create target segments for highly focused, personalized up-sell and cross-sell campaigns and promotions. Built-in report query tools help you target customers by past purchases, demographics, marketing activity, and other factors within your database. Use NetSuite’s up-sell wizard to get automatic recommendations on new products or offers to feature. Accept PayPal, Google Checkout, and multiple currencies. Manage multiple webstores and catalog businesses. Customers and partners can track orders through their own self-service portals. Give customers negotiated prices, credit limits, and terms. Give high-volume customers lower prices, or establish high-margin pricing for cash sales. Automatically turn web orders into invoices with workflow managing, fulfillment, approval, and billing. Streamline the order-to-shipment process with real-time visibility into every step. Orders trigger all fulfillment processes, from inventory drawdown to printing shipping labels. Sell products through multiple channels. Information flows into the same order, inventory, and customer management system. 24/7 access to self-service center for viewing order statuses, tracking packages, reviewing and approving quotes, reordering, viewing purchase history, updating shipping and payment information, requesting returns and refunds, and more. Create password protection for all or just a part of your site, restricting access to certain customers. Restrict who can view pricing and/or content on the site. Get real-time tracking of marketing programs, from lead to opportunity and true sales revenue. Create online forms that populate your CRM system at submission. Capture customer information in one system to determine customer lifecycle value from renewal, up-sell, and cross-sell revenue. Mine customers’ purchases and interaction histories so that you can create highly targeted and personalized cross-sell and up-sell campaigns. Built-in reports show how customers found you, what pages they visited, and the revenue made from referrers and keywords. Change and optimize paid keyword search spending to maximize returns. Track and manage paid-search campaigns by to keyword and search engine in real-time. Maximize website effectiveness with web analytics. See how often site pages are viewed and how many unique visitors view them. See how frequently people return to the site, how many times they visit, and average pages views. Track how returning leads and customers are navigating through the site. Monitor conversion rates to see how many visitors registered on the site or finished a purchase. Follow up on abandoned carts to improve customer conversion ratios and sales. Review cart abandonment rate at any timeframe. Shopping activity reports show you the ratio of cart additions to orders. Identify and analyze opportunities for up-selling and cross-selling. Review individual customer activities through their account/profile. Track marketing program results by lead source, program type, and promotions. Pinpoint the revenue from each lead source/referrer and keyword advertisement. Access data on actual revenue per visitor and customer for each referrer and keyword. Compare conversion rates across different search engines and affiliates. 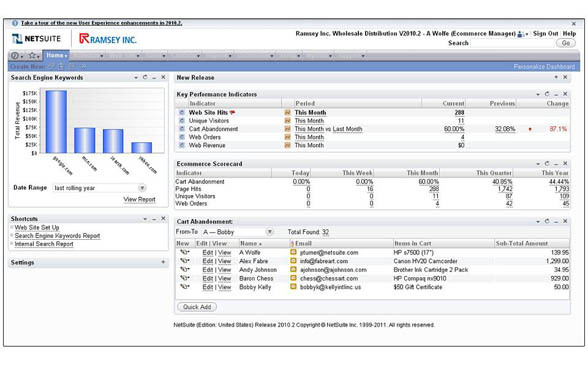 Create reports you need with NetSuite’s ad-hoc analysis capabilities. Share and email reports, or add them to your NetSuite dashboard. Add-ons and third party solutions available through SuiteApp. Product images don’t appear in Google Image Search. May not be able to download/export certain data. NetSuite Ecommerce goes beyond just order management by providing web marketing, analytics, customer service, and more into one solution. Managing your Ecommerce site is made easier with NetSuite’s tools, and detailed analytics and reporting allow you to keep track of trends and revenue more simply. While it is comprehensive, NetSuite Ecommerce doesn’t have everything, such as online product reviews, but you can generally find third party applications and add-ons through NetSuite’s partners that can provide any missing functionality for you. NetSuite also has CyberSource Decision Manager integrated into its Ecommerce solution so that online retailers can more easily flag fraudulent purchases. There are customer complaints that the SEO options for NetSuite Ecommerce are not up to snuff. Product images don’t appear in a Google Image search, which is not necessarily a huge deal, but it depends on what kind of SEO you want to have for your site. Additionally, if you’re doing your hosting and content management through NetSuite, you may not have the rights to download and export all of your data should you choose to migrate to a new solution, so double-check with NetSuite on what information you possess the rights to when using their system.